JEE Main II Admit Card 2019: National Testing Agency (NTA) has released the admit card for JEE Main (II) April exam on March 21. Candidates can download their admit card online at jeemain.nic.in. Candidates will have to use their registration number and password/Date of Birth to login and download their admit card, once it is released. The admit card will have the details of their date, time and venue of examination. Moreover, in a latest notice released by NTA for JEE Main April exam, it has been announced that the JEE Main April Exam dates are slightly changed due to the Lok Sabha Election dates. Earlier it was announced that the JEE Main April exams will be held from April 7 to 20. But now, according to the revised exam schedule , the paper 2 of B. Arch/ B. Planning will be conducted on April 7 while the paper 1 will be conducted on April 8, 9, 10, 12. The e-Admit Cards of candidates (who have paid the fees) have been uploaded on the JEE website www.jeemain.nic.in. The candidates are advised to download their e-admit card of JEE (Main) - 2019. In case any applicant is not able to download his/her e-Admit card, he/she may contact NTA Helpline No's between (10.00 AM to 5.30 PM) on working days. The candidates may note that no eAdmit Card will be sent to them by post. The Process of Online Application Form Submission for JEE MAIN 2019 was completed from 01-09-2018 to 01-10-2018. The examination of JEE (Main) - 2019 in Computer Based Mode (Online) Examination will be conducted on 09 to 20 January 2019. Step 1: Firstly the appearing candidates will have to visit the official site of JEE Main at jeemain.nic.in. Step 2: Click on the Admit Card link flashing on the Home page. Step 3: Now the login credentials need to be entered that includes JEE Main 2019 application number, password and security pin and click on submit. Step 4: The JEE Main Exam Admit Card 2019 admit card will be displayed on the screen. Step 5: Candidates will have to download the admit card. Step 6: Keep a hard copy of the admit card for further reference. Until the admit card is released, candidates can check the examination city, date and shift by entering the login credentials at the official site of JEE Main. JEE Main 2019 examination carries 360 marks and will be conducted for a duration of 3 hours. The result of the same is to be declared on January 31, 2019. Candidates can check in more details from the official site of JEE Main. 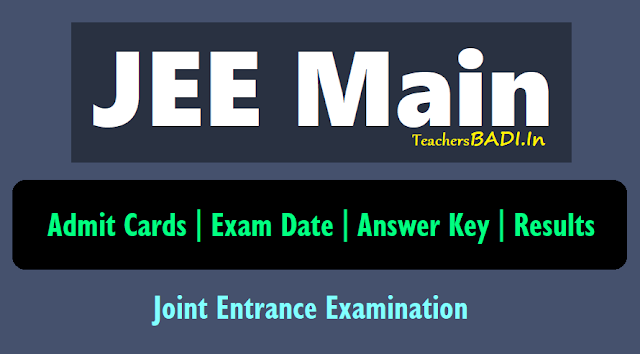 First Shift : 9.30 a.m. to 12.30 p.m.
JEE Main 2019 admit cards: Candidates are advised to keep a check on the official website on the dates mentioned above Admission to the examination centre would not be permitted without an Admit Card Students are alerted that the JEE Main 2019 admit cards would not be sent on the registered email id. Candidate should keep a check on the official website for the updates. The candidates are advised to visit the examination center a day before the conduct of examination to know the exact location of the center to avoid any delay in reporting at the examination center as per schedule. No candidate will be allowed to enter the examination hall after the time of last entry.